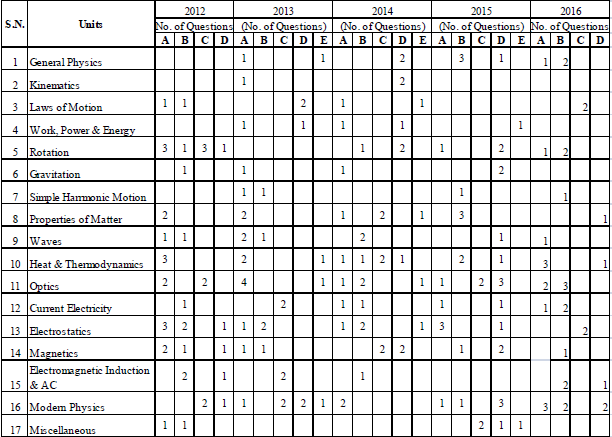 As we know papers based on same pattern all times, so this is important to get a view of papers trends. 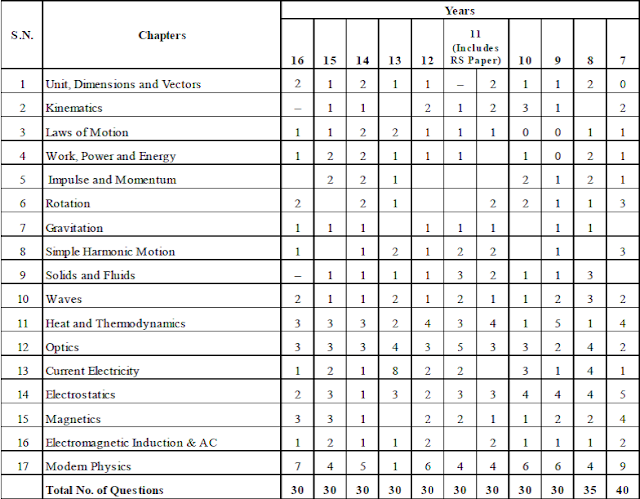 In this post, I have provided chapter wise trend analysis of AIPMT from 2006-2015. This page is reserved for make a meaning full discussion for candidates. Use Discus form below the page. 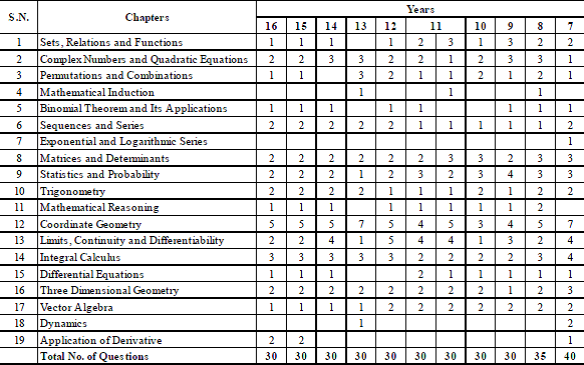 The complexity of the IIT JEE arises from the fact that the questions are always unique in their context, and solving them often requires a combination of concepts from across the different chapters. 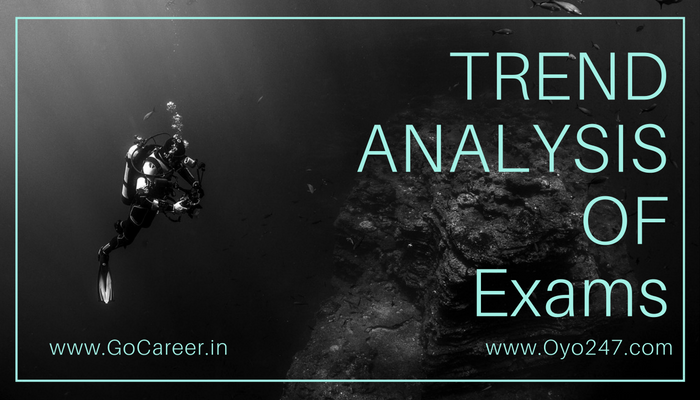 Nevertheless, some basic data analysis can be quite revealing and could give some important insights into how one should go about preparing for each subject and chapter. Such analysis forms the basic of our understanding of the JEE. It had been intriguing, all the time, for all the students. But as soon as we understand, “how it is that same syllabus is being asked differently in different exams”, our efforts will be different for different exams and results will be uniformly BRIGHT (Good). 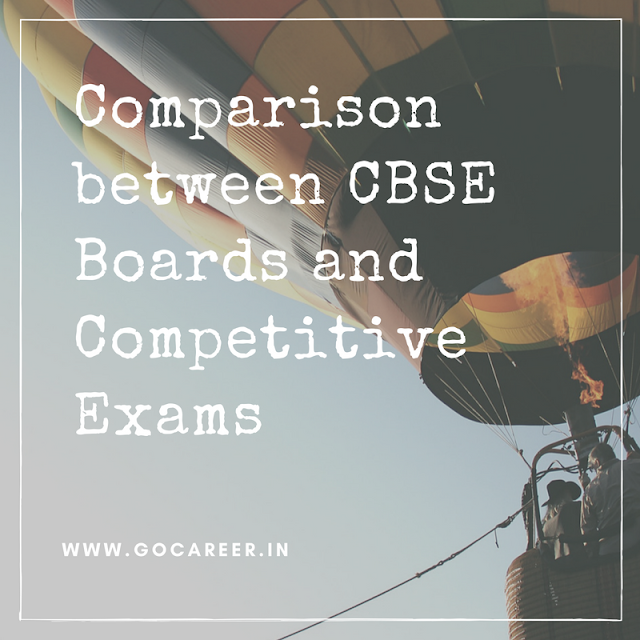 In other words, there is absolutely no difference in the concepts involved in the questions asked in the various board and competitive examinations. The difference comes in the way, it is asked in these exams. Wherein the boards, they check the conceptual clarity of a student, in the competitions, it is the application of the concepts which is stressed upon. Further, this application skill may vary from exam to exam. 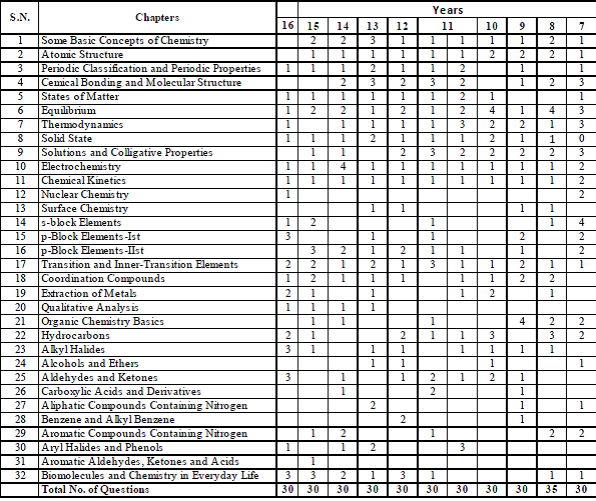 The same syllabus, same students, the same hard work, but different results !!! What they ask in CBSE ? (a) What is a Projectile? (b) Find out the maximum range & maximum height for a given velocity (u) & ratios thereof. (c) Find the range of a Projectile falling from a horizontal table etc. 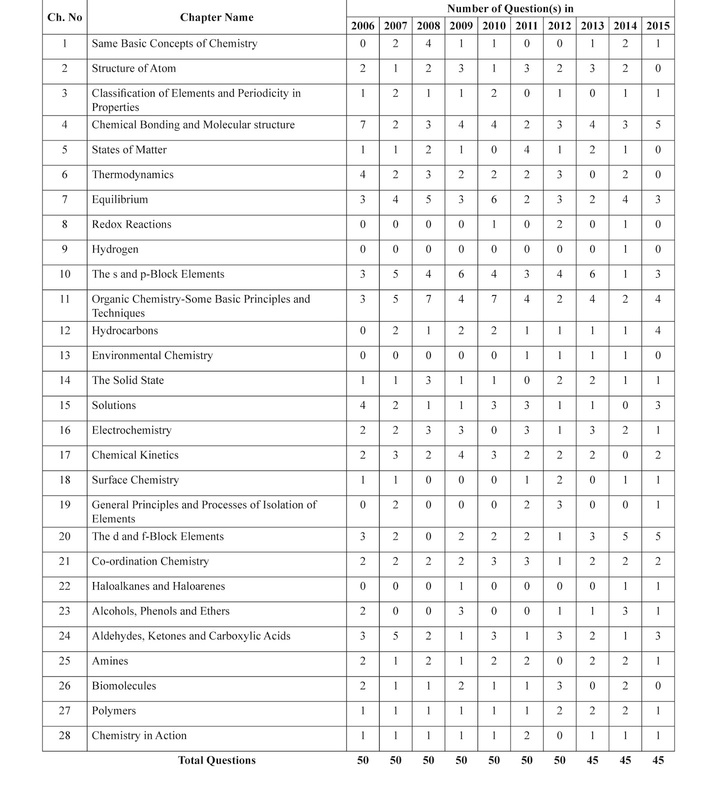 What they ask in JEE Main/ NEET ? (a) What is the minimum Kinetic Energy of the projectile with an initial velocity (u) & angle of projection (j), the mass of the object being (m) ? (b) How much time it would take to reach a height ‘h’ ? 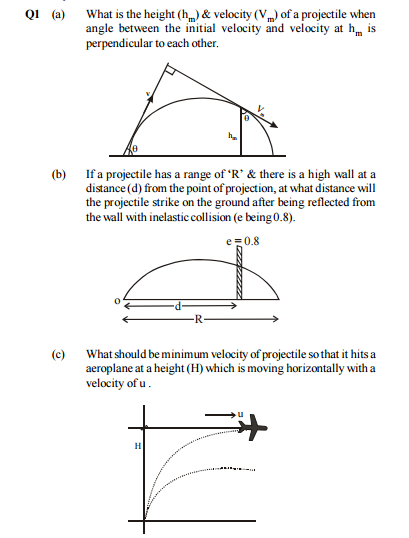 (c) What should be its velocity at height ‘h’ ? 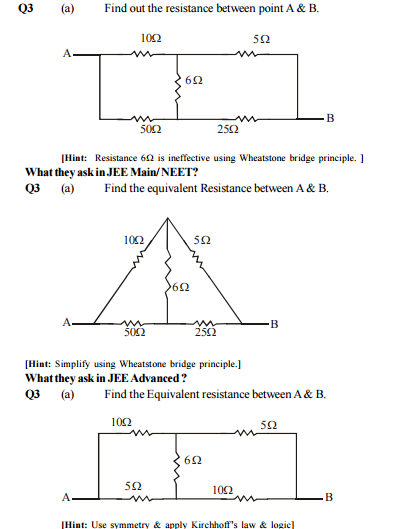 What they ask in JEE Advanced ? What they ask in CBSE? CBSE asks straight forward Questions to TEST the knowledge. 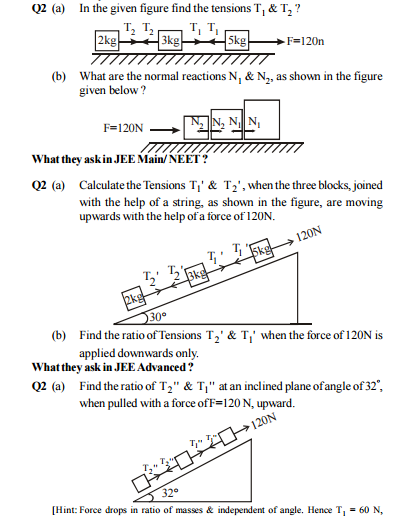 JEE Main/ NEET asks the application level questions but simple calculations. 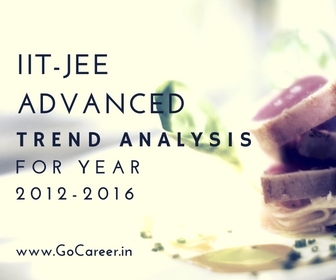 JEE Advanced asks analytical ability & depth in the Concepts & some times smart calculations. JEE Main Entrance Exam for admission into various engineering courses in different engineering colleges and institutes in the country has hit the imagination of the school-going students more than any other entrance test conducted at this level. 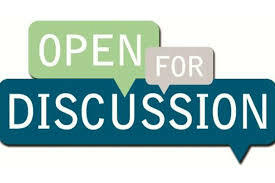 Without argument, you need to be well-versed with the pattern as well as the level of the questions asked in the exam. 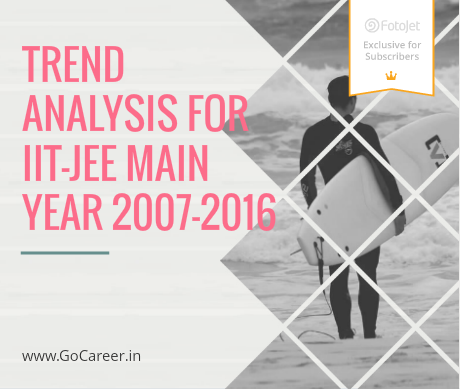 A Chapter wise analysis of previous years’ questions is called for here, with this objective in mind, we are giving the chapter-wise analysis (break-up) of the questions asked in last 10 years’ of JEE Main. JEE Main 2017 exam is the most sought exam among the students of India. JEE (Joint Entrance Examination) is a two tier examination (Main & Advanced) regulated by CBSE Board. The qualified candidates can get admissions in UG eng./ architecture courses in NITs, IITs and other institutions through JEE Mains examination, whereas IITs provide admissions to eligible candidates through JEE Advanced examination. Who should appear for it? What is the eligibility criteria? Candidate's date of birth should fall on or after 01 October 1992 for general candidates and 01, October 1987 for SC, ST and PWD candidates. Candidates appearing/passed 12th or equivalent exam in 2015 or 2016 with PCM and minimum five subjects are eligible to apply. Those who have passed 12th or equivalent exam in 2014 are not eligible to apply. Candidate should secure at least 75% marks or be in the top 20 percentile in the 12th Class Examination conducted by respective boards. For SC/ST students this condition shall be relaxed to 65% marks. Candidate can attempt JEE Main exam three times only. To qualify for JEE advanced candidate must obtain the minimum cutoff marks in JEE Main. JEE Main Exam will be conducted on 02/04/2017. Duration of this Exam will be of 3 hours. JEE Main online exam will be conducted in the second week of April 2017. JEE Advanced Exam will be conducted on 21/05/2017.It has two papers (Paper 1 & Paper 2) each paper will be of 3 hours. In order to appear in JEE Main 2017, a candidate can apply only online by logging onto www.jeemain.nic.in. Candidates with a score above a particular cutoff will be eligible to appear for JEE Advanced 2017. JEE Main paper consists of 90MCQs with single correct option divided into three sections. 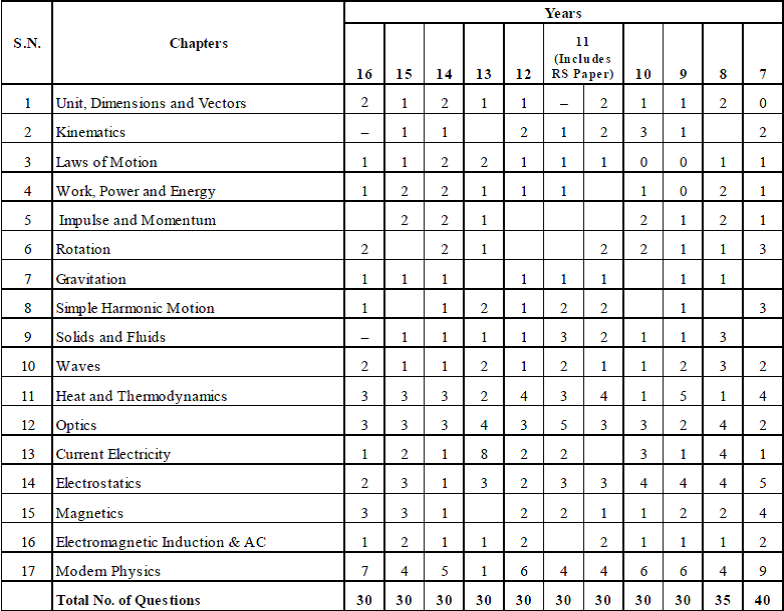 (a) Physics - 30 MCQs (b) Chemistry - 30MCQs & (c) Mathematics - 30MCQs . JEE Advanced consists of two papers (Paper 1 & Paper 2).Each paper will consist of the sections physics, chemistry and mathematics. 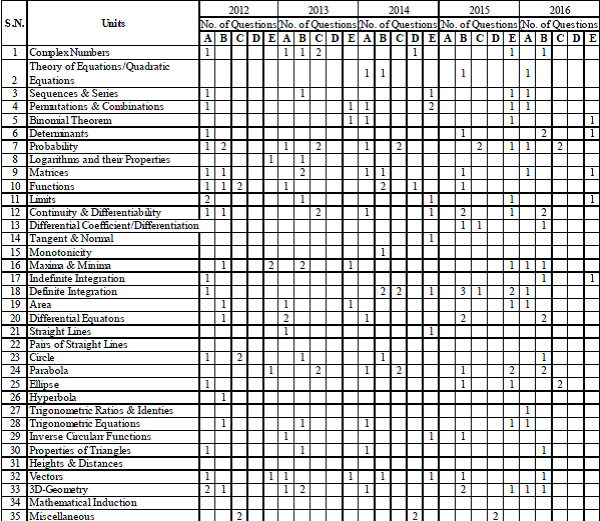 Each section will further have a different variety of MCQs. 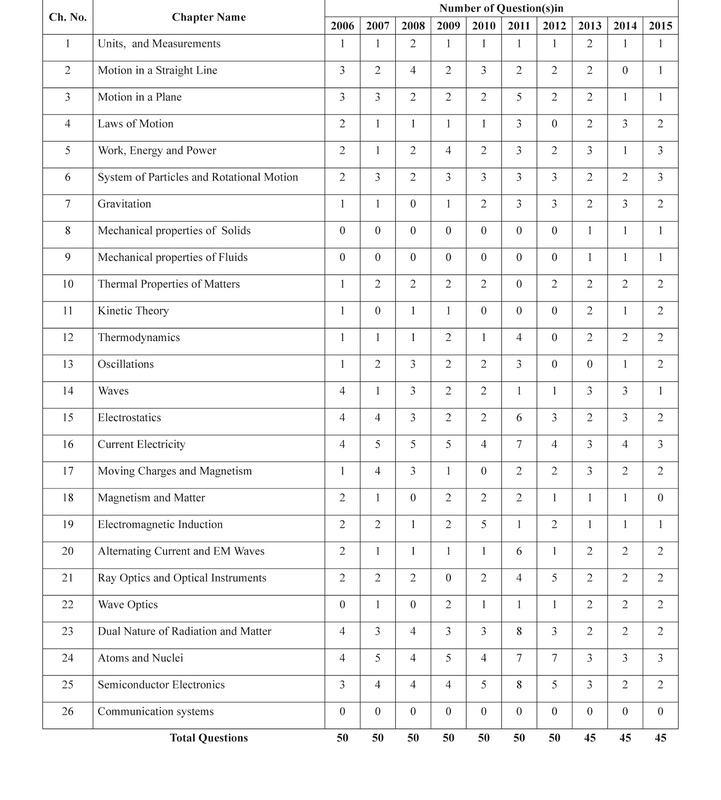 Total number and variety of MCQs vary every year. 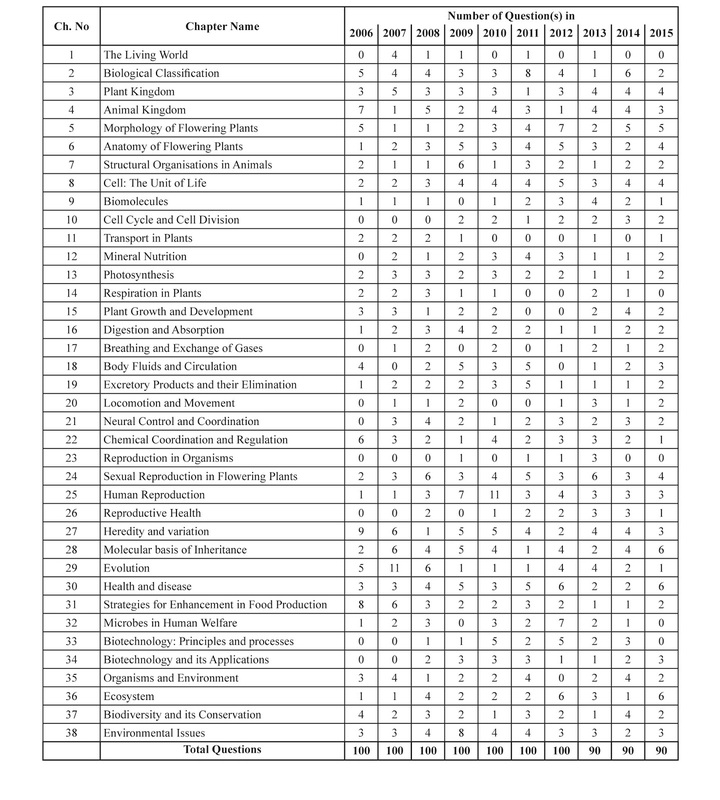 What will be the language of JEE paper? Candidates can opt between English and Hindi as a medium of language for question paper. The language of questions paper has to be specified at the time filling application form. What is the marking scheme for the exam? Maximum Marks:: 90 × 4=360 ,4 Marks will be Awarded for each Correct response. 1 Mark will be Deducted for each Incorrect response. 0 Mark for not attempting a question. 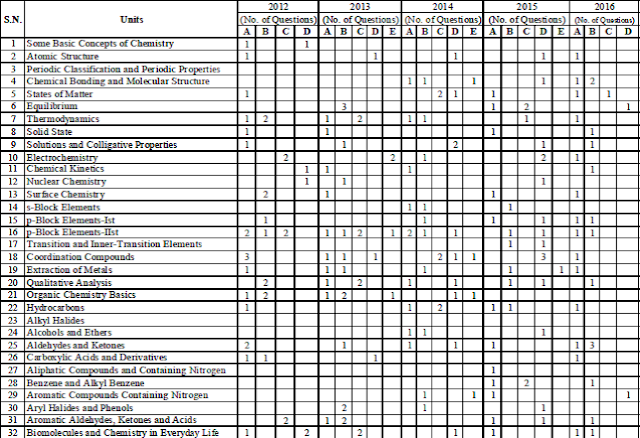 Marking scheme for JEE Advanced may vary depending upon the variety of MCQs in each section. What is the scope of the exam? / What are the future prospects for the candidate who clear the examination? Candidates who will clear JEE Main Exam with the good score are eligible for admission in BE/B.Tech courses in reputed NITs ,IIITs & CFTIs across the country. Those candidates who qualify JEE Advanced Exam with the good score are eligible for admission to IITs. Merit list of qualified candidates is made on the basis of their score in JEE Exam. Besides this merit, there is also reservation quota, 15% seats for SC candidates. 7.5% seats for ST candidates. 27% seats for OBC candidates. 3% seats for physically challenged. What are other similar exams ? The major change is that there will no weightage of Class 12 marks for calculating the rank in JEE Main exam. Secondly, candidates who wish to qualify for admissions based on JEE ranks have to secure at least 75% in class 12 exam or be in the top 20 percentile of Class 12 exam conducted by the respective boards. 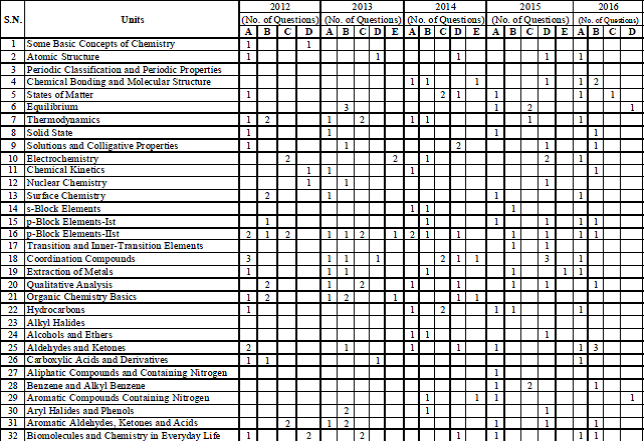 There has been no big change made in the syllabus, exam pattern, eligibility criteria, etc. BITSAT,VITEEE,SRMJEE and Other State board Engg. Entrance Examinations.